What size poles are guys using for tarp tie outs? If you add a little suspension to each end (6-8") and narrow the base to 72" you might have more clearance from the poles. But as CMC4Free said, if it works you are doing it right. Yup. 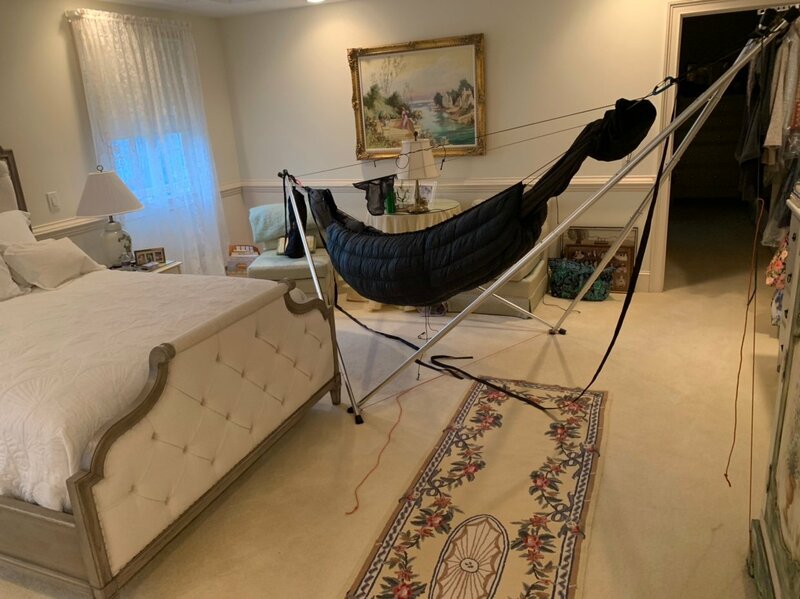 For reference, we’re finding that a 12’3” hammock requires no suspension and provides plenty of head/foot clearance with a baseline of 72”. Making up the difference in suspension with your 11’ should roughly approximate. Tensa Outdoor, LLC, maker of the Tensa4 tensahedron hammock stand, and the Tensa Solo ultralight flavor too. That's really cool. That supports my (incredibly amatuer) findings that my approx 11ft, possibly longer DIY hammock needs just a little bit of suspension on the ends to fit on the stand correctly. I have never quantified that with actual measurements though, just eye-balled it and 'hey it feels good'. If nothing else, for my own benefit, I think I'm going to reset my baseline to 72" and maybe take some actual suspension measurements. I was wondering what most people are using as suspension with the stand. I'm getting one for my birthday and want to be all ready. I have a war bonnet xlc with strap and buckle. Can I just run it really short or is a longer CL better or something else? For suspension, only no-go is something you can’t make short enough, like some whoopies/UCRs. So tie a loop? We figure most users will carry tree suspension with them, and that works fine. We’ve entertained idea of integrating short daisy chains into the kit for simplicity, but nothing’s simpler than nothing, so. When you are staying at parents house but would rather sleep in a hammock. I love it! That was me recently, but i chose the porch. "God never sends us anything we can't handle. Sometimes I wish He didn't trust me so much." - Mother Teresa.